Click here to explore the book. All academic writing requires skills in critical thinking, close reading, argumentation and research, but disciplinary differences among the humanities, social sciences, natural sciences, and applied fields leave students and instructors frustrated by a one-size-fits-all approach to these skills. For writing programs committed to preparing students for the full range of disciplines they will enter, An Insider’s Guide to Academic Writing presents a proven pedagogy that helps students to adapt to the academic writing tasks of different disciplinary discourse communities. The pedagogy features a series of flexible, transferable frameworks and concrete connections to the disciplines including unique Insider’s video interviews with scholars and peers. 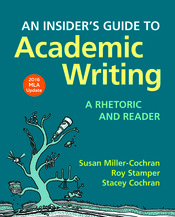 Based on the best practices of a first-year composition program that has trained hundreds of teachers who have instructed thousands of students, An Insider’s Guide to Academic Writing offers two books in one: an innovative rhetoric of academic writing (available as its own book), and a thematic reader that foregrounds real readings from the disciplines. Use ISBN 978-1-319-05355-0 to get access to the online videos for free with the brief text and ISBN 978-1-319-05354-3 for the version with readings. An Insider’s Guide to Academic Writing provides a well-organized and clear approach to the introduction to academic and professional disciplines. I would (and have) described this to colleagues as a way to approach the subject of writing across the curriculum in a way that will not be overwhelming the students.